Are you a social consumer? To be a social consumer, first you need to know what social commerce is. 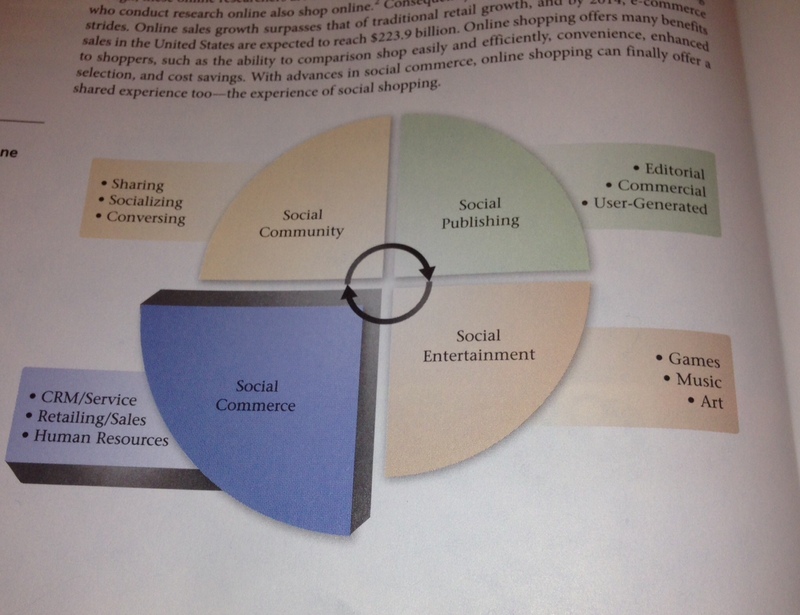 According to the textbook, social commerce is a subset of e-commerce. In case you are not exactly sure what e-commerce is, it is when you buy or sell a product or service on the Internet. Social commerce is basically just like e-commerce, with the exception that the product or service is bought or sold through a social media application, or more simply an app, instead of just straight through the Internet. Also included in social commerce is online reviews and ratings, deal sites, shopping apps, and social shopping malls. I didn’t even know such a thing as a social shopping mall existed. Social commerce is also the 4th and last zone of social media, see graph below. Now back to being a social consumer. Do you think that you are a social consumer? I wasn’t sure I was, but I am now. I have bought several things through apps and never even thought about being a social consumer. But then again, it’s hard to know whether you are something, like a social consumer, when you are not 100% sure what it means. Most recently, I just bought a purse, well let’s be honest, three purses, from my Ebay app. Like I said before, I never even thought one thing about the fact that I was purchasing something through an app, it’s just become like second nature I guess. It really is easier, to me at least, to purchase things through apps that through websites anymore. I didn’t know I was a social consumer, but I do now, just another thing to add to the increasingly long list of things I have learned from my social media class.